Dual 2-prong connector attached to 10 inches of 16 gauge wire. 12 inch overall length. The wires can be cut in the middle to form a detachable wiring harness or cut at one end to form a single 2-prong connector. 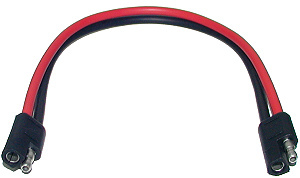 This connector is commonly used to connect lighting and accessories or the battery charger to the battery pack of an electric scooter or bicycle. 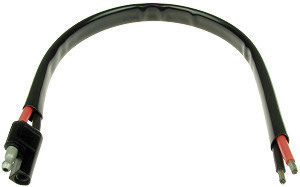 Single 2-prong connector attached to 11 inches of 12 gauge wire with black PVC sheathing. 12 inch overall length. This connector is commonly used to connect the battery pack to the speed controller or speed controller to the motor of an electric scooter or electric bike. Two mating 2-prong connectors attached to 11 inches of 12 gauge wire. 13 inch overall length. The wires can be cut in the middle to form a detachable wiring harness or cut at one end to form a single 2-prong connector. 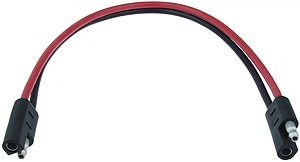 This connector is commonly used to connect the battery pack to the speed controller or speed controller to the motor of an electric scooter or electric bike. Two mating 2-prong connectors attached to 11 inches of 10 gauge wire. 13 inch overall length. The wires can be cut in the middle to form a detachable wiring harness or cut at one end to form a single 2-prong connector. 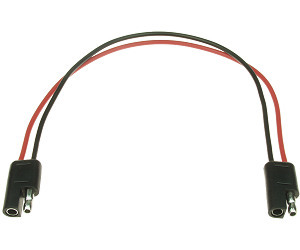 This connector is commonly used to connect the battery pack to the speed controller or speed controller to the motor of an electric scooter or electric bike. Two mating 2-prong connectors attached to 17-1/2 inches of 12 gauge wire with black PVC sheathing. 19-1/2 inch overall length. 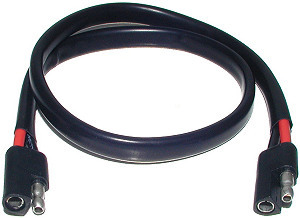 This connector is commonly used for connecting the battery pack to the speed controller or speed controller to the motor of an electric scooter or electric bike.